Video conferencing: In a standard video conference, small teams can gather for a live, two-way video transmission. For example, two companies discussing a merger may decide to link each others’ board rooms so that both teams can meet face-to-face from a remote location. Moreover, two parties may engage in a simple video conference over their laptops. Screen sharing can be used to enhance collaboration, too. Two major players in the video conferencing space are the BlueJeans Network and Vidyo. Web conferencing: Is your business looking for a more collaborative online experience than a video conference? In that case, you should invest in a Web conferencing solution. Think of a Web conferencing solution as a way to share and edit documents in real-time, with an added audio component. 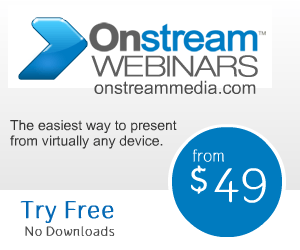 In some solutions, such as Onstream Media’s Web Conferencing platform, you can also stream multiple media types at the same time (like video and graphics). Besides Onstream, other leading Web conferencing services include Cisco WebEX and IBM Lotus. Webcasting: Suppose you want to reach a massive online audience to broadcast a keynote address or provide a quarterly update for your shareholders. In this case, you would turn to a Webcasting solution. Webcasting software is typically much more scalable, as it’s designed to accommodate thousands of users at a time. In most cases, the software works in conjunction with a content delivery network to ensure high-quality video streams with minimal latency or packet loss. Onstream Media, for instance, has a network of over 100,000 servers across 75 countries. GoToMeeting and ON24 also both offer high quality webcasting services as well. Want to learn more about the type of service that is right for you? Contact Onstream Media today!